Cybercrime is starting to intensify once again as the Christmas season gets nearer, so if you’ve decided to shop online to avoid monstrous traffic jams, click with care to avoid getting scammed. Fake merchants and scammers may spread malicious content and/or links disguised as shopping promos or advertisements. These are rampant most especially during the holidays. 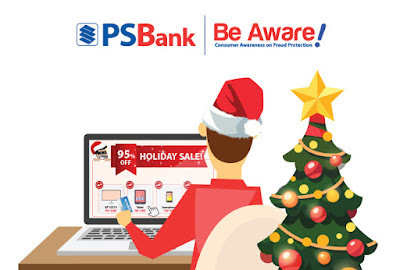 With more people embracing online shopping for their Christmas needs, PSBank reminds everyone to stay vigilant in cyber space. “We remind everyone to be critical of the ‘promos’ or ads that they see online. In the old world, not everything that glitters is gold. In the Internet, not everything that looks like a golden opportunity will give you a glittery deal. So, before you click, think with care,” said PSBank First Vice President for Information Security Dan Jose D. Duplito. Just this year, the WannaCry Ransomware attack infected hundreds of thousands of workstations worldwide, including the Philippines. The program makes your files inaccessible, demanding payment in exchange of getting back your files. Payment, however, does not always guarantee file retrieval. The ransomware spreads by clicking suspicious links or email attachments, which then executes the program. One may also accidentally download it by visiting dubious websites. Do not click links right away received from unknown senders. Always verify the sources of emails, attachments, or links sent to you. Back-up important files regularly. If possible, store sensitive data in an external hard drive or USB. Install and regularly update trustworthy antivirus software on your devices. Turn off your Internet connection immediately. Be vigilant and observant okay :) Happy online shopping!! !